A Colorado Springs owned & operated dumpster rental company. Use our Load N' Go service! Need help loading your dumpster? 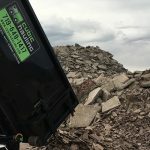 Cubic Hauling Dumpsters is a locally owned and operated Dumpster Rental Colorado Springs company offering residential and commercial dumpster service. 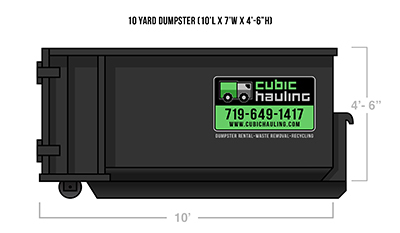 We are roll off dumpster experts specializing in delivering smaller “mini” – 5,10,15 cubic yard dumpsters that fit into tight locations in our highly maneuverable 4×4 trucks. By providing smaller dumpster rentals, we save you space and money. You won’t overpay for a Super Size McDumpster that’s too large, or can’t fit where you need it. Everything You Need to Know About Renting a Dumpster. 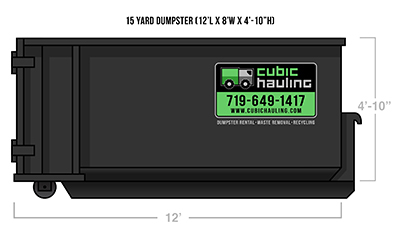 It’s EASY to order a dumpster rental from Cubic Hauling! Locally Owned & Operated: Save money and receive better customer service. Our pricing is local not higher broker based prices. We manage all aspects of your dumpster service. New Equipment: Clean, freshly painted dumpsters and trucks that perform well, and are easy on the eye. Mini Dumpsters: Mini dumpsters have a small ground footprint, optimal height for loading materials into and easy walk in access. We Go Where the Others Cannot: Our 4×4 trucks can deliver our mini dumpsters to nearly any location, under any conditions, and precisely place your dumpster in a convenient loading spot. HomeAdvisor Screened & Approved: We have passed the HomeAdvisor screening process. Rest assured that we are a reputable company. 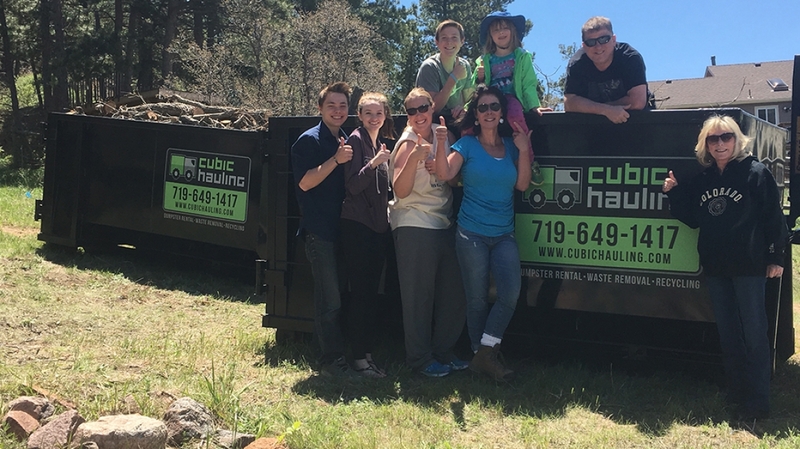 Cubic Hauling is a local Colorado Springs dumpster rental company. We make the entire dumpster rental process from ordering, delivery, and pickup easy, fast, and seamless. We are equipped for and can execute any job large or small. Experienced and trained management. Over 20 years construction industry experience. We have new state of the art equipment and technology. Clean and freshly painted dumpsters and logo’d trucks perform well and provide a professional appearance. Caring, experienced, knowledgeable staff, that is committed to service that exceeds customer’s expectations. We carry General Liability & Transportation Insurance for your protection. We offer competitive and upfront pricing. 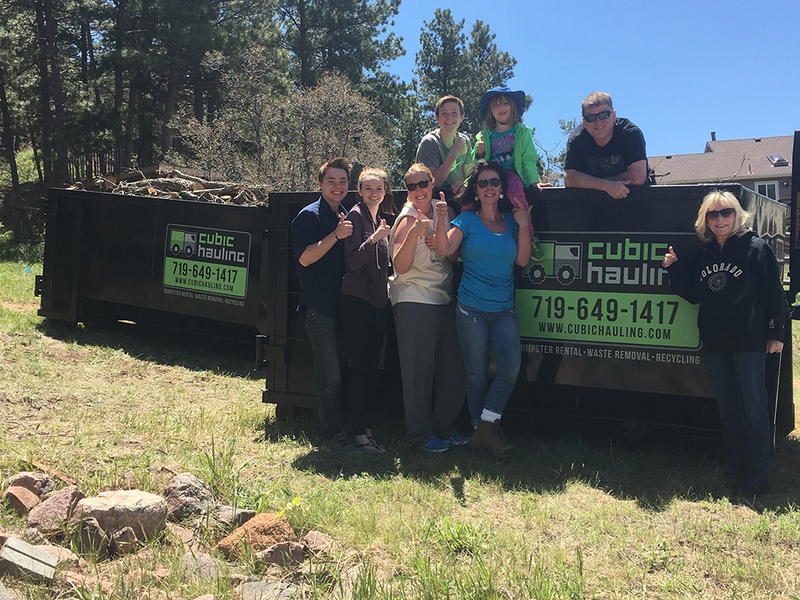 Cubic Hauling is a LOCAL Colorado Springs owned and operated dumpster rental company, not a broker or national franchise. Therefore, our competitive pricing always offers great value. 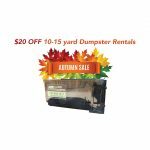 We provide upfront pricing before a roll off dumpster is delivered. Happy customers giving a big Thumbs Up! Completely professional and timely service. Both drop off and pickup. The smaller customized delivery vehicle makes maneuvering the dumpsters into tight places easy, and Cameron takes great care in not damaging concrete or landscaping - unlike the big roll off with a bang trucks. Competitive pricing with everyone else in the Springs, but the friendly, timely and professional service makes the difference. Highly, highly recommended. Cameron was quick to respond to my inquiry. We discussed the purpose of the rental to determine the appropriate size of dumpster. He was prompt on delivery and placed wood under the dumpster to protect my driveway. He was courteous and professional throughout the process. I plan on using Cubic Hauling again. Awesome service. He went out of his way to help us. Honest and reliable still exist!! Cameron, the owner, was very courteous, prompt and accommodating. I called him late on a Friday afternoon and he had a dumpster at our house the next morning. He went out of his way to make sure we had sufficient time for our project and he went above and beyond to accommodate our specific needs. I would highly recommend. This was the first time we used Cubic Hauling and loved the service they provided. We were having our roof replaced and the dumpster was the right size. We loved that they were able to bring out the dumpster the same day. They were on time, friendly and professional. We will definitely be using them next time we need to rent a dumpster. You can't ask for better service. I'm doing a major home renovation in Black Forest and Cameron (owner) has been responsive and professional. He brought protective boards to ensure the dumpster didn't damage our custom driveway. He'll call you back immediately and do a drop-off or pick-up within 24 hours. You can't ask for better service and the price is great as well! Great guy, clean dumpsters, efficient service! Owner came out to look at my demo job to be sure the job would fit in his largest dumpster. Sure enough it was just right. Very friendly, honest and prompt service at a very fair price. I would highly recommend cubic hauling! This company is outstanding with very affordable prices. The owner went out of his way to ensure I got the dumpster I needed. I will definitely be using Cubic Hauling again. Great service from Cameron at Cubic Hauling! Needed a dumpster last minute and Cameron came through when I was in a jam. Will definitely be calling on Cubic Hauling in the future when I need his service. Thank you Cameron for your help! If you need a dumpster then Cubic Hauling is who you need to call! This company provides quick service and clean dumpsters. The owner is super friendly, helpful and always returns texts or calls. He also puts down boards under the dumpster wheels to protect your driveway. I also liked that they have somewhat smaller dumpsters that can fit in tighter areas. These shorter dumpsters still hold a whole lot of stuff! I highly recommend Cubic Hauling! One of the most pleasant transactions I've ever experienced! This company has your back and will not disappoint. State of the art equipment and unparalleled service makes this company a jewel. Wish I could give them 10 stars. I needed a dumpster on a Saturday. I called 3 companies and no one could come out until Monday. When I finally called Cubic Hauling and had a dumpster on my driveway within 2 hours. The price was on par with the other companies in town, but the service was next level! Thank you for helping me when nobody else would. Cameron went out of his way to provide top notch service and I am truly grateful. I got ripped off! NOT by Cubic Hauling, but by a fraudulent landscaper. I was left with A LOT of yard debris from a torn down fence. We called Cubic Hauling and the same day they showed up. Cameron of Cubic Hauling restored my trust in private business owners. He is professional, fair priced, and local. Don't hesitate to call this guy if you got stuff to haul! 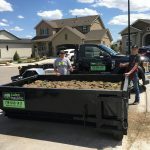 Cubic Hauling is your best option in Colorado Springs. Cameron is extremely professional and will go out of his way to help you and make any accommodations he can with your project. His equipment is always clean, he is on time, and will ensure he protects your property from damage while dropping off and picking up the dumpster. Cubic Hauling's prices are also the best in town. No need to look any further for all your dumpster needs! Cubic Hauling was excellent in customer service and made the process very easy! I will definitely be using and recommending them in the future! Great business. I needed to get rid rid of a bunch of railroad ties treated with creosote. Difficult to get rid of. Cameron figured out what he needed to do to dispose of hazmat and took them for me. I used his dumpsters again a few months later after I cleaned my garage and he offered a "load and go" service. He is easy to work with and charges very reasonable prices. I'd recommend Cubic Hauling to anyone. This is a locally owned business. When you call, you will speak to the owner, Cameron. He told me he would be able to put a dumpster in my driveway, which sits atop a steep, windy path. He did it perfectly. he was on time and was a pleasure to talk to. I will be calling on him again, I'm sure. Recommended! The owner is very nice. His equipment is well maintained and clean. The dumpster is washed before it's brought over. He is very considerate of your property. Excellent price. I highly recommend this company! Very flexible and always on time. Cameron is easy going, professional and helpful. Best company I’ve worked with! Always on time, professional, and very friendly. Load & Go’s are super fast and reliable. Wouldn’t work with any other company honestly. The owner is very nice. This is his own business not a franchise. His equipment is well maintained and clean. He is very considerate of your property. Excellent price, fast service, returns customers call right away! My husband and I highly recommend this company. Friendly and professional. Very responsive to phone call and text. Got a same day delivery and pick up next day. Very clean trash bin. Happy to do business and I highly recommended to anyone. Private company and don't have to deal with franchise companies. Cameron helped us load the dumpster, and he was very personable and friendly. He assisted with loading up the dumpster which was very helpful. Affordable and professional. Five stars. This is my first dumpster rental in CS and Cubic Hauling Dumpsters will always get my business. Cameron provided excellent customer service along with a great product. He is flexible and easy to get in contact with. Cameron and Cubic Hauling Dumpsters have earned a definite 5-star rating! The owner is a great guy. Family owned and operated and the nicest people ever. Prices are beyond great as well. Cubic Hauling is the best dumpster service around! Their dumpsters are clean and are painted pretty! They are not your typical atrocious dumpster that are a complete eye sore. The service was on point and super professional! I live in the Broadmoor and highly recommend them for any trash removal needs. The owner is a very friendly and easy guy to work with. He was extremely efficient, excellent communication and worked with our schedule! The price was the best we found as well. We used the mid size dumpster to get rid of a lot of stuff for moving. I highly recommend using this company! Very helpful. Fast service, reasonably priced and very nice. I would use them again. Cameron was very accommodating and great to do business with. If you like supporting local businesses and need a dumpster, then I highly recommend Cubic Hauling. Seriously the best service I have experienced. The staff was courteous, and really wanted to make sure we had the right size dumpster for us. They were super quick and getting the dumpster to us at a great price. I would very much recommend cubic hauling to anyone looking for a residential dumpster. I contacted them after hours they responded and had a dumpster to me first thing in the morning. Awesome service,best looking equipment around and the driver was a real professional. It does not get any better than this !!! Cubic hauling was prompt and very courteous. They delivered on the same day out in Peyton, and were super friendly and helpful. I will definitely be using them again. Project: Rent, Deliver & Pickup a Waste Dumpster. Cameron was great to work with. He answered all my questions that I had about what I could put in the roll- off dumpster and even let me dump a mattress and a box spring at no extra charge. His customer service is better then 5 stars. 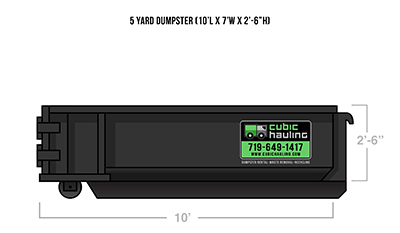 I highly recommend using Cubic hauling if you are looking to rent a roll-off dumpster. Top notch service!!!! Cameron was very professional and so very polite. Worked with our schedule and the price was affordable as well. Would recommend highly!!!!! Thanks Cameron!!! Cameron was super professional, quick to respond, and very easy to work with. He is incredibly flexible with times, he even extended my rental by nearly a week with no additional cost, and runs an extremely competitive price. He works saturday drop-offs with no surcharge which is a huge savings cost. I will without a doubt happily recommend his services to anyone renovating a house or just requiring a dumpster rental. Quick drop off and pickup. Great service and price. The quick response made it possible to get my home ready to sell. I highly recommend to everyone I know. Project: Rent, Deliver & Pickup a Waste Dumpster Cameron was fantastic to work with. He was very responsive and accommodating. My weekly trash service provides comparable roll-off dumpsters for a little less money. But Cameron's customer service was head and shoulders better than them and the other five or six companies I spoke to. Also, Cubic Hauling's equipment was clean and very new looking. Best looking dumpster and truck I've seen. I would not hesitate to recommend CH to anyone I know with this need. Great price clean and easy access dumpster. I will use then for my next load. Thank you. I thought they were great....no worries on my end. Quick, easy and convenient...they took care of everything...love the staff! So glad we found them. Project: Rent, Deliver & Pickup a Waste Dumpster Excellent customer service. Great follow up and will definitely work with them again. Super professional from start to finish! Fantastic communication, scheduling, pick-up and pricing! Cameron (the owner) really nice guy as well. My go to company for future removal. 5 star service. Best haul off ever. Great customer service and always willing to help in any way he can. Dumpster never even touched the driveway! We will definitely keep in contact with Cameron from now on! Fantastic experience, the owner operator of this fine local business takes great pride in his work and his service, 6/5 stars. I needed a dumpster for my home renovation and wanted it quick, I called Cameron at 11:30 he carefully placed a clean, swing door, not bent up, dumpster at 13:00 on the same day. I called just about everyone, his prices are competitive, his equipment clean and high quality, and his service couldn't be better. I wouldn't think about getting haul away service elsewhere. This is the guy to go to. Great service....tearing off our deck and needed a 15yd dumpster.....Cameron was great....very friendly, great service, he works with for what you need....5 stars....I will for sure rent a dumpster from him again. This is a wonderful company! They worked out very well. I was able to get a dumpster delivered and picked up the same day. They are very professional and so honest. They take pride in making the customer happy. Definitely refer them whenever I can! Great communication and timely pickup. Thank you, Cubic Hauling. This company offers a "load and go" service, where the dumpster is delivered and you throw all your stuff in and it's hauled away same day. It really is cost effective and efficient on time. This option was just what I needed to get rid of all my trash from moving in less than one hour. The staff was kind and on time, plus they did a great job. What an amazing experience! Cubic hauling is the way to go for reliable, very reasonably priced, and fabulous customer service! I had ordered one dumpster- but needed a second that was immediately brought out the next day. The dumpsters are new and clean. They are very concerned about proper and legal placements of dumpster. They called when they said they would, delivered and picked up when they said they would, and charged what they said they would! There prices were much cheaper than all the other quotes with no hidden fees! Wow! An honest company with great prices and service!! Excellent service! I just finished renovating a house in the Springs and needed to clear construction debris, but didn't need a big 30yd dumpster or a 20yd. I called around and couldn't find a price or availability that I liked or needed, and stumbled upon Cubic Hauling. I called and spoke with Cameron and immediately discovered an apparent and sincere level of customer service. Cameron did a phenomenal job at providing all information I needed while determining if his service would be suitable, and he also educated me on various aspects of the service. He worked diligently to deliver an appropriately sized dumpster for my needs, delivering and removing the dumpster on a schedule that fit my strict timeline, and also made many efforts to accommodate me however possible throughout the process. I am happy to have found this company, as it serves a great niche, especially when the larger companies are booked out or too expensive. Great work! Cameron was awesome! Affordable. Professional. I'd use him again. Very competitive pricing and quality service. Cameron is a great guy. Prompt, friendly and skilled. Arrived and parked, dropped the container with ease right on target made for super easy loading of old fence, made sure to help remove any items and house things that were in the way that could be damaged by the container. Extremely professional, could not recommend more. Cameron was awesome! He is just leaving my place now. He is super personable, prompt, and priced right. I will recommend him to anyone that needs dumpster services. We did the load and go service and got it all loaded in about 30 minutes. Thanks again Cameron!! Due to the recent snow storm, I had several large tree limbs that collapsed from the weight into my yard and my neighbor's yard. Knowing that the city would not take care of it since it was not on a city street, I started looking to rent a dumpster. I always do a bit of research before choosing any store or service based on online google searches. In this instance, I learned Cubic Hauling was a locally owned business and not a broker. This, for me, was very important. One, a broker costs more. Two, it's good practice to support local business. In retaining this service I discovered that Mr. Cameron (owner) is extremely helpful and friendly. I will finish by saying I normally do not find the time to write reviews for goods or services unless it really stands out, which this experience does. I would definitely recommend this company and will use him in the future. Excellent prices and customer service. The owner, Cameron is extremely helpful and kind. I would definitely recommend this company and will use him in the future. So many good things to say! On time, great competitive pricing, clean dumpsters, flexible, professional AND friendly!!!! Would recommend to anyone anywhere! "We rehabbed an investment property before renting it out. Three dumpsters were ordered over a few weeks to remove construction debris and yard waste. Unlike other dumpster companies we called, Cubic Hauling was able to fit their dumpster into the small alley access area we requested. The dumpsters were delivered and picked up on schedule, and they were very clean, easy to load. Their staff was great, and the entire process was seamless and easy from start to finish. If you think you need a dumpster, call Cubic Hauling, we highly recommend them." "It’s hard to find reliable and professional customer service anymore, but in this case I got lucky. I have used Cubic Hauling several times and each time I have been very happy with the results. The dumpster was delivered almost immediately and picked up without a problem. I will continue to use this company and highly recommend them." "Cubic Hauling is one of the best companies I have dealt with in awhile. The owner takes pride in his job and puts your needs first. He does what he says and is there on time, all at a great price." "I used Cubic Hauling for a weeklong project and had a dumpster delivered to my driveway. Cameron came out and set it up on wood that he provided making sure the dumpster never touched or scraped my driveway. Most of the other companies I called either didn't offer that or wanted to nickel and dime me to death. One company would not even deliver a dumpster unless I provided the plywood for them to set up on, and then they were more expensive than Cubic. Give Cubic Hauling a call, I think you will be glad that you did!" My husband and I had to tear down our outside fire pit (brick, cement, rubar) and clear up our property of large wooden pallets to look immaculate for putting it on the market. Cubic Hauling owner, Cameron, worked with us to meet our goal and was so wonderful and accepting of our large Projects needs! The cost was beyond affordable for 10 tons of materials at the end of our time with Cubic Hauling. I will continue to highly recommend this company to everyone I run into who needs assistance and hauling away their excess trash or building materials. You can rest assured that you are making the right decision to use this company!! I had 15 years worth of accumulated stuff lying around my 40 acre property that I needed to get cleaned up. When I called around for prices, Cubic Hauling was both available and reasonably priced. The service was great, and the dumpster was delivered on time. The delivery went smooth, and it was placed exactly where I asked. When called for pick-up, they came the next morning and got it. There were no surprise added costs, and I will definitely use them again. Remove Unneeded, Unwanted & Cleanout Junk Today! 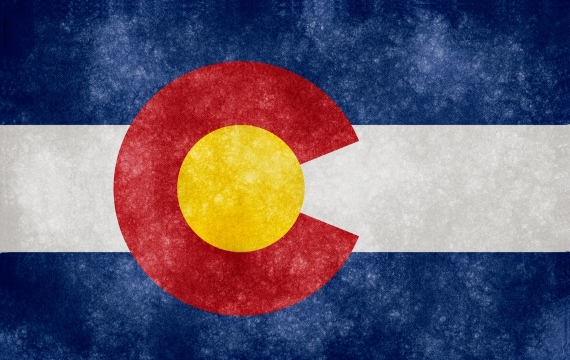 Our Dumpster rental Colorado Springs service areas include the following towns and cities. We serve commercial and residential customers. Call 719-649-1417 today for a free estimate regarding your dumpster rental, junk removal, recycling, construction, waste removal needs!